Walter Glen Christiansen was born in Bensonville, IL and grew up in the suburbs of Chicago. 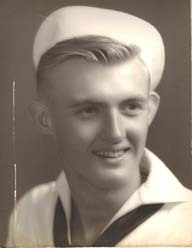 He served on the USS West Virginia as a gunners mate, surviving the battleship’s torpedoing and sinking at Pearl Harbor. He later served in the Battle of Midway on Motor Torpedo Boat Squadron 2, then went on to Guadalcanal in the Solomon Islands, serving as crew chief on PT 59 commanded by John F. Kennedy. He was also involved in the rescue of World War I flying ace and Eastern Airlines executive Eddie Rickenbacker and his crew when their plane went down in the Pacific in October 1942. Glen, as he was called by his family and friends, passed away on January 29, 2012. He was married to his wife Jeanne for 67 years and has 2 sons Scott and Todd, daughter Kris, 5 grandsons, 3 great grandsons.